These are two of the most mis-identified butterflies I know of! "Painted Lady" is such a common name, many people do not realize that there are two different kinds. 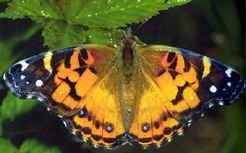 Both are 'brush-footed' butterflies, in the Nymphalidae family, True Nymphalinae subfamily. Now that you are throughly confused, lets see if I can help UN-confuse you on the differences. How do you tell the difference between the two? When you learn the two obvious differences in the butterfly forms, it's easy - if you are lucky enough to get a good, close look! 1. First, the top side. The color pattern of both types 2 1/2 inch wings is orange, black, and white, and not in any order. The black tips are dotted with white, the remaining half is a swirl of orange and black. 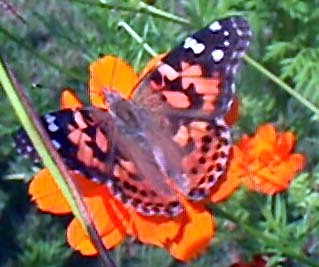 The American Lady (AL), though, has one white spot in the middle of a patch of orange on each forewing that the Painted Lady (PL) does not. PL has white spots on its forewings, but none of these spots appears against and orange background. 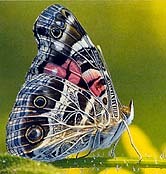 If your butterfly has a white spot against an orange background, it's an AMERICAN LADY. 2. Now, look at the under side of the wings. Here's where the big difference lies. AL will have two large eye spots. PL has four eyes and they aren't as big. Remember: American ladies have big eyes. 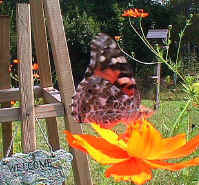 AL loves to nectar on Heliotrope, Yarrow, Mallow, Zinnias, and Daisies. PL loves to nectar on Thistles, Pentas, and Lantana. AL host plants include Everlasting and Daisies. My friend Rosita, in Michigan, found they also love Licorice Plant (Helocrism). PL hosts include Thistles, Hollyhock, and Borage.